The NY Times has an interesting piece this morning on the "long conference" where all of the summer petitions will be considered. The odds of a grant from the long conference are particularly low. Can't the Court meet a few times over the summer to consider the filed cert petitions? Would that be such a burden in addition to the 70-75 cases that they hear a year? Four weeks from now, on Sept. 28, the Supreme Court justices will gather in private for an annual ritual called the “long conference.” They will consider the roughly 2,000 petitions to hear appeals that have piled up over the summer. And they will reject almost every one. Meantime Liptak (the author of the article) and Orin Kerr are fighting about whether Justice Thomas here. Here is the original NY Times piece that Kerr take on. Who has the better of the debate? Kerr seems to make valid points about the flimsy statistics cited by Liptak. Federal authorities arrested Michael J. Hernandez, 25, of Orlando, and Jonell Vega-Mercado, 21, of Clermont, in June when they tried to pick up packages from a shipping and mailbox store in Hollywood. Homeland Security Investigations agents said the packages contained the key ingredient for making the synthetic stimulant, which often causes hallucinations and psychosis. The packages were addressed to fake names and were intercepted while being shipped to commercial mailboxes in Weston and Hollywood, authorities said. The men ordered large amounts of the drug to be shipped from labs in China and the conspiracy went on from January to early June, according to the plea agreement. The men paid cash for mailbox services and used fake identities when they picked up the shipments. Both men pleaded guilty to one count of conspiring to import the drug ingredient at a hearing in federal court in West Palm Beach. The charge carries a maximum punishment of 20 years in federal prison and a $1 million fine. Peruvian woman who admitted she illegally smuggled a product into South Florida to perform an illegal "buttocks enhancement" procedure was sentenced to 10 months in federal prison on Thursday, court records show. Teresa Nunez Orrego, 46, was arrested in May during an appointment with an undercover federal agent who posed as a client who wanted a "buttocks enhancement." The arrest was made at the Hallandale Beach apartment of Nunez's South Florida contact who scheduled her appointments. Nunez had promised she would boost the woman's rear end with injections of a top-quality Swiss product for the bargain price of $1,000, according to court records. Federal authorities said Nunez hid vials of silicone, with fake labels that claimed it was more expensive hyaluronic acid, in her luggage on a flight from Lima, Peru to Fort Lauderdale-Hollywood International Airport. Also concealed in her luggage were large hypodermic needles, syringes and vials of lidocaine to help treat reduce the pain involved in the procedure, according to agents from the Food and Drug Administration and Immigration and Customs Enforcement. “He tried to nail Ben to the wall." Robert Feitel, a veteran lawyer with a long history of prosecutions, charged into court as the Justice Department’s point man to take on a prominent Miami lawyer in a case that came to symbolize the rights of attorneys to accept fees from international drug traffickers. Feitel accused lawyer Ben Kuehne of fabricating documents to cover up dollars for the Medellin Cartel. He accused him of orchestrating the payments through overseas wires. He even said Kuehne knew much of the money came from the sale of drugs. Now, years after the case ended, Feitel is cast in a strikingly similar position as the man he once prosecuted. The Miami Herald found that more than $100,000 in drug money belonging to criminal organizations was sent to Feitel’s law firm by South Florida undercover officers posing as money launderers to infiltrate drug groups. Well, the opening round of Don King Productions, Inc. v. Shane Mosely was, in Judge Williams's view, pretty much even, which means that the Mosely-promoted Grudge Match between Mosely and Ricardo Mayorga will proceed this Saturday night at The Forum in Inglewood, California as planned. In a lengthy order denying Don King's promotional company's (DKP) motion for a preliminary injunction, Judge Williams found that sufficient evidence showed that Mayorga had entered into an agreement with DKP for it to exclusively promote Mayorga as a professional boxer. But she also concluded that DKP had failed to show a "substantial likelihood of success on the merits" about whether the agreement was still in effect and whether DKP had waived certain of its provisions. Plus, there was no irreparable harm that money couldn't remedy. So, Judge Williams concluded, the "extraordinary and drastic remedy" of stopping the fight simply wasn't called for. DKP v. SSM et al. -- Order Denying Pl.&#x27;s Mot. Prelim. Inj. A longtime metro Atlanta court administrator, Douglas Mincher, has died at the age of 57. Mincher, who became clerk of court for the U.S. Court of Appeals for the Eleventh Circuit earlier this year, died on Sunday of an apparent heart attack, according to Circuit Executive James Gerstenlauer. Mincher had been chief deputy clerk for the Northern District of Georgia from 2010 until being hired for the Eleventh Circuit job. He previously had worked for several years for the city of Atlanta, combining and administering its municipal and city courts. Eleventh Circuit Chief Judge Ed Carnes said the news was a shock, noting that Mincher was a cyclist who exercised regularly to keep fit. "He would tell everybody who would listen that this job was his dream job," said Carnes, adding he had hoped that Mincher would be the clerk through the rest of his term as chief. Hiring law clerks who have experience: A bad thing? FIU law professor Howard Wasserman has an interesting post today at PrawfsBlawg about the "unfortunate trend," in his view, of judges' tending to hire law clerks who have some real-world experience, rather than straight out of law school. He notes that this trend seems to be increasing, particularly in the Southern District of Florida. His ideal partner would “know what she wants” and would not be afraid to ask for it. A “big toy collection” would not be all that bad either, he wrote. He also boasted of his sexual prowess in his profile, the Orlando Post shared. “I want someone that fantasizes about being brought to a climax by a lover with a skillful tongue and fingers as well as his member,” he added. 2. Jeb Bush does not have a black hand. But this flier! A campaign leaflet sent out by a pro-Bush super PAC that shows him with a black left hand, and his body apparently super-imposed on a picture of Cedar Rapids, Iowa. “Jeb Bush has a Photoshopped photo for an ad which gives him a black left hand and much different looking body. Jeb just can’t get it right!” the real-estate mogul said of his rival for the 2016 Republican nomination, who he has frequently assailed recently on the campaign trail. 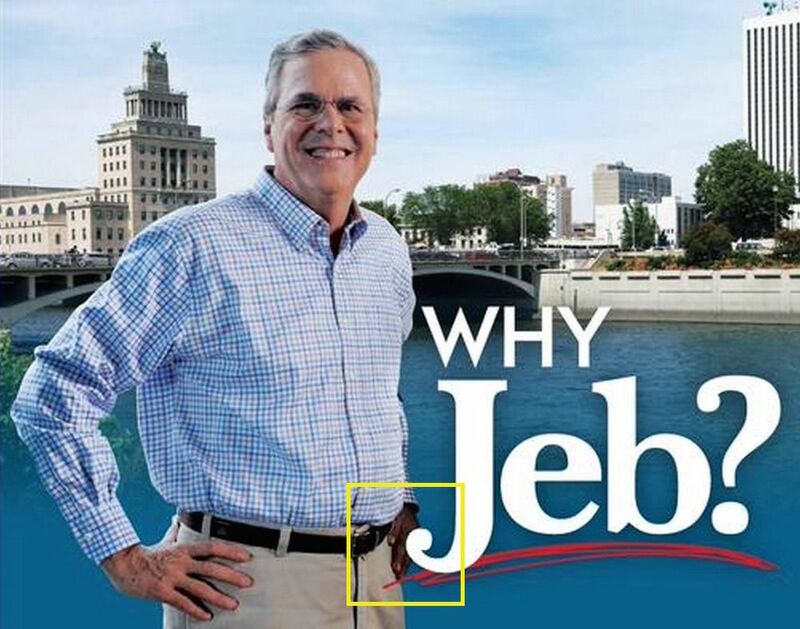 The leaflet’s copy, “Why Jeb?” ended up being co-opted by bemused Twitter users to ask, “Why, Jeb?” as to why his hand had become black. The original campaign leaflet was sent by the Right to Rise USA Super PAC to some 86,000 Iowans, as Bush seeks to raise his game amid lackluster polling in the first-in-the-nation caucuses state. Oh and welcome back to school... and traffic! Don King and "Sugar" Shane Mosley square off in the S.D. Fla.
Former pound-for-pound best fighter in the world “Sugar” Shane Mosely took to Twitter yesterday to discuss a lawsuit brought by Don King’s promotional company (DKP) against him, fellow boxer Ricardo “El Matador” Mayorga, and others seeking to put a halt to the upcoming “Grudge Match” between Mosely and Mayorga, currently scheduled for August 29. According to court documents, Mosley’s seeking to fight Mayorga in the Grudge Match would tortiously interfere with DKP’s exclusive contractual rights to promote its client Mayorga. A hearing on DKP’s motion for a TRO and preliminary injunction was held yesterday before Judge Williams. Thoughts on the strength of DKP’s case? C’mon, Shane! This is the Southern District of Florida! And you have a great judge. Fair enough. Staying silent is probably best until this all gets resolved. Hope it works out for all involved. Stay tuned. In other news, the Eleventh Circuit issued a few interesting decisions this week, reminding lower courts that they should essentially never vacate arbitral awards, and discussing the risks of providing your cell-phone number to entities that might text you advertisements. Enjoy your last day today. Jeffrey Allen Rowe, a prison inmate proceeding pro se, is suing various prison officials under 42 U.S.C. § 1983. Rowe accuses the officials of deliberate indifference to his serious medical need, specifically, need for proper treatment of his reflux esophagitis aka gastroesophageal reflux disease (GERD). I must dissent, however, from the reversal of summary judgment on Rowe’s claim regarding the timing for administering his medicine between January and July 2011 and after August 2011. On that claim, the reversal is unprecedented, clearly based on “evidence” this appellate court has found by its own internet research. The majority has pieced together information found on several medical websites that seems to contradict the only expert evidence actually in the summary judgment record. The majority writes that adherence to rules of evidence and precedent makes a “heartless … fetish of adversary procedure.” Yet the majority’s decision is an unprecedented departure from the proper role of an appellate court. It runs contrary to long-established law and raises a host of practical problems the majority fails to address. Using independent factual research to find a genuine issue of material, adjudicative fact, and thus to decide an appeal, falls outside permissible boundaries. Appellate courts simply do not have a warrant to decide cases based on their own research on adjudicative facts. This case will become Exhibit A in the debate. It provides, despite the majority’s disclaimers, a nearly pristine example of an appellate court basing a decision on its own factual research. Law-office or judicial-chambers medicine is surely an even less reliable venture. The internet is an extraordinary resource, but it cannot turn judges into competent substitutes for experts or scholars such as historians, engineers, chemists, psychologists, or physicians. The majority’s instruction to the contrary will cause problems in our judicial system more serious than those it is trying to solve in this case. In other words, to use a health-care metaphor, the medicine here is worse than the disease. 1. The Wilkie Ferguson Courthouse was closed yesterday for two hours while the feds dealt with a suspicious package. This happens on a daily basis at the state courthouse and it doesn't cause lockdowns for two hours where no one can get out of the building. What took two hours and why is it safer to lock people up in the building for two hours? During oral argument in this case, the Court, in effect, asked counsel for the government whether a salaried person who earned $9,000 a week and deposited it in cash weekly, intending at least in part to evade the reporting requirement, committed the crime of structuring under 31 U.S.C. § 5324(a)(3). The government suggested that such a person did. Today the Court embraces this construction of § 5324(a)(3) as the law. Granted, most of us do not have the problem of trying to figure out what to do with our $9,000-per-week salary, but this same logic applies to any weekly salary payment under $10,000. And it does not end with weekly salary payments. As a result of today’s ruling, in this Circuit, no matter how small a sum of money a person may possess or otherwise enjoy a right to control—even if only a few dollars—he may find himself facing structuring charges if he goes to the bank often enough to create the appearance to the government of engaging in a pattern of financial transactions of $10,000 or less. I suppose that we will discover in the coming years how frequent a bank visitor one must be to imperil himself, but, in any case, it is clear today that § 5324(a)(3) has taken on a far broader reach than Congress ever intended. Within four years of their arrival in the United States, Glock firearms worked their way into American pop culture in Die Hard 2, when Bruce Willis’s character John McClane made the remark, “That punk pulled a Glock 7 [sic] on me. You know what that is? It’s a porcelain gun made in Germany. Doesn’t show up on your airport X-ray machines, here, and it cost more than you make in a month.” http://www.imdb.com/title/tt0099423/quotes (last visited Aug. 15, 2015). Ironically, the statement was factually inaccurate in just about every way. Today was another moving Boot Camp graduation for 32 young male cadets through the Miami-Dade Boot Camp Program. For 20 years, Miami-Dade Corrections has been putting young men and women, previously destined for lengthy prison sentences, through the rigors of Boot Camp and giving them a second chance on life. The program is a big success. The numbers speak for themselves -- a recidivism rate of only 8%. This ceremony was particularly special because of two guests. Jason Bravo, a former Boot Camp graduate, now lawyer, spoke to the class about believing in themselves and continuing on the right path, as hard as it may be. 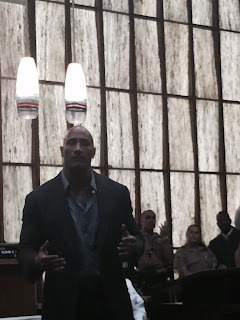 Dwayne "The Rock" Johnson also spoke to the cadets and their family members, disclosing that he had been in trouble with the law multiple times as a teenager and knew what it was like to disappoint his family and friends. Had it not been for people seeing the potential for more in him, he would have ended up in prison. Judge Nushin Sayfie had previously told the graduates that they may not be like the Rock, but they had the ability to become something good. Johnson followed up on this thought and told them that it's true that they wouldn't be like him. Instead, they could become something even better than him. It was very inspiring. HBO was there filming for a documentary that Dwayne Johnson pitched, heavily supported, and will appear in. 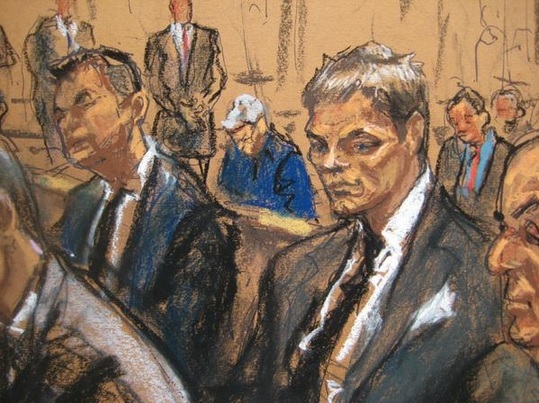 It was a good day in criminal court. The feds used to have boot camp as well, but it was disbanded back in the early 90s due to budget cuts. It should be put back in place and it should use the state as a model. Dave Clark's defense contended that the developments were legitimate and only collapsed because of the financial recession, not due to any criminal wrongdoing. The attorneys for Cristal Clark, meanwhile, said she relied on her husband and his financial advisers and committed no crimes. In June 2014, Dave Clark was extradited from Panama and Cristal Clark from Honduras to face the U.S. charges. Both have been jailed as flight risks ever since. After Cay Clubs failed, Dave Clark and two partners formed a Cayman Islands-based company that opened a string of pawn shops across the Caribbean known as CashWiz. Some of the fraud charges against the Clarks stem from that business, with prosecutors contending the couple were illegally siphoning off for themselves cash the company was making buying and selling gold. Congrats to the FPD's office and to Aimee and Alex. This is a good example of why judges are too harsh with bond. It takes a lot of courage and perseverance to wait in jail over a year to try your case. The New York Times covered the bail problem with a front page story here. The story focused on low-level indigent defendants, but it's really a huge problem in all cases as judges have become more and more stingy with bonds, even for first-time non-violent offenders. For many young lawyers who dart down the halls of the criminal courthouse, the history of Miami-Dade’s legendary legal dramas — along with the names of famous lawyers and often infamous defendants — might ring unfamiliar. There was Ted MacArthur, the ex-homicide detective who murdered his wife in 1989. Joseph Hickey, the son of a Miami judge, who tried to extort $2 million in a bizarre kidnapping hoax. And Al Sepe, the Miami judge who did 18 months in prison in the notorious “Court Broom” judicial corruption scandal that erupted in 1991. “It was the second-biggest corruption scandal in the nation’s history, and no one remembers it,” said Miami-Dade Circuit Judge Diane Ward as she walked down a hallway behind her courtroom. Thanks to Ward, the enduring images of those and other important trials — sketched in bold pastel strokes by South Florida courtroom artists — now hang in a hallway behind her fourth-floor courtroom at the Richard E. Gerstein Justice Building. For the judge and lawyers who recently loaned her framed sketches, the corridor has become a mini-museum documenting not only the cases of yesteryear but the fading art of courtroom sketching. Last week, the Seventh Circuit held that Johnson v. United States, which held that increasing a sentence under the Armed Career Criminal Act's residual clause is unconstitutional, applied retroactively on collateral review. Today, the Eleventh Circuit, in a 2-to-1 decision, came to the opposite conclusion. This application for leave to file a second or successive motion to vacate, set aside, or correct a federal sentence requires us to decide whether the decision of the Supreme Court in Johnson v. United States, 135 S. Ct. 2551 (2015), established "a new rule of constitutional law, made retroactive to cases on collateral review by the Supreme Court," 28 U.S.C. § 2255(h)(2). Gilberto Rivero was sentenced as a career offender under what were mandatory United States Sentencing Guidelines, and his judgment of conviction and sentence was upheld on direct appeal and collateral review, id. § 2255. Rivero now applies for leave to file a second or successive motion under section 2255. Because we hold that Johnson did not establish a new rule of constitutional law made retroactive to cases on collateral review by the Supreme Court, we deny Rivero's application. We acknowledge that one of our sister circuits has held that Johnson applies retroactively to decisions on collateral review, but we are unpersuaded by that decision. See Price v. United States, No. 15-2427 (7th Cir. Aug. 4, 2015). In Price, the Seventh Circuit explained that "[t]here is no escaping the logical conclusion that the [Supreme] Court itself has made Johnson categorically retroactive to cases on collateral review" because "[a] defendant who was sentenced under the residual clause necessarily bears a significant risk of facing a punishment that the law cannot impose upon him." Id. at *7. We disagree. We can "escap[e] th[at] logical conclusion" because Congress could impose the punishment in Johnson if Congress did so with specific, not vague, language. I dissent because I believe that in Johnson v. United States, 135 S. Ct. 2551 (2015), the Supreme Court announced a new substantive rule of constitutional law that the Court has made retroactive to cases on collateral review. In no uncertain terms, the Supreme Court has said that "decisions that narrow the scope of a criminal statute by interpreting its terms . . . . apply retroactively . . . ." The majority concedes that Johnson is that very type of narrowing decision. So does the government, which does not contest Johnson's retroactivity. I say yes. If Supreme Court Justices can write books and give speeches, what's the real difference? A month after U.S. District Judge Richard Kopf of Nebraska abruptly shut down his controversial blog, he still believes federal judges and even Supreme Court justices would do “far more good than harm” if they publicly blogged and tweeted. “Properly done, the public’s perception of the federal judiciary is enhanced when judges speak and write candidly about our courts,” Kopf said in an exclusive interview with The National Law Journal. Kopf added that he might blog again—but not about judging or the law. “I have burned too many bridges to continue that activity on a regular basis,” he said, expressing regret about some but not all of his headline-making blog posts over the past two years. For example, he stood by his June 22 post in which he urged Justice Anthony Kennedy to “zip the pie hole shut” on issues like solitary confinement. The 68-year-old Kopf ended his blog Hercules and the umpire on July 9, after learning from Judge Laurie Smith Camp, chief of the U.S. District Court for Nebraska, that it came up during a retreat for court employees that Kopf did not attend. She told him that the "great majority" of the employees indicated they felt his blog had become an embarrassment to the court. That discussion followed a July 6 post in which Kopf pronounced U.S Sen. Ted Cruz, R-Texas, "demonstrably unfit to be president" because of his proposal that Supreme Court justices stand for judicial-retention elections every eight years. NLJ: With benefit of hindsight, do you think you should have stayed your pen, so to speak, and not posted your more controversial opinions? I'll ask about some of them, one by one. First, telling the Supreme Court to STFU because it decided to rule on the Hobby Lobby case involving contraceptive coverage in health care plans. Kopf: First, nothing that follows is intended to make excuses for my many errors. I don’t regret writing most of the Hobby Lobby post. The last sentence is the one I regret. Specifically, I do regret using “STFU.” Using that acronym was unnecessary and distracting; it was also too cute by (at least) half. Kopf: The subject of how female lawyers dress for court was worthy of discussion, but the post was offensive. When I wrote it, I thought the post was merely sardonic and self-mocking. I was wrong. But, as my old law partner and dear friend used to say, there is no fixing dumb, and that applies to me in spades. Big thanks to the the guest bloggers and posts while I was away. Entertaining, informative and a little different than what you usually get from me, so that's really great. Lots of complaints about prisons in the press, but not much action. Here's the L.A. Times on the Supermax, and the Washington Post on solitary confinement. When will the Supremes take up the issue? Former Broward Teachers Union President Pat Santeramo was indicted. Paula McMahon is covering the story and Ben Kuehne is defending. The 11th Circuit finally decided to dump one of the most ridiculous procedural rules ever. Now if the Supreme Court decides an issue after you've filed your initial brief, you can still raise the issue in a supplemental filing. Looks like the 4th Circuit in Graham created a Circuit split with the en banc 11th in Quartavious Davis on the cell-site data issue. Hopefully the Supreme Court will take it (I'm biased as I am counsel of record for Davis). My co-counsel, the ACLU, covers the story here. Thanks to each of you who participated in last week’s poll on citing document numbers. You overwhelmingly chose “D.E.” over the other options. Perhaps there’s some sarcasm there. But the comment touches on a serious topic. Given each lawyer’s style and the challenge of adequately making arguments within the page limit, the question whether we should use 1.5 or 2.0 line spacing for our documents arises with some frequency. First of all, when it comes to line spacing, do we—lawyers practicing in the Southern District of Florida—have a choice? And if we do, how to choose? The local rules say we have a choice. Local Rule 5.1(a)(4) permits court documents to “have not less than one and one-half (1 ½) spaces between lines.” But some judges require documents to be double-spaced. So how we space our documents may be governed by the judge we’re appearing before. Assuming we have a choice, what, then, should it be? There’s no easy answer. According to the Internet, many people think that 1.5 line spacing is easier to read. Others tout the environmental benefits of 1.5 line spacing; all things being equal, you use fewer pages. And there’s good precedent for it. When he was on the Southern District of Florida, Judge Jordan was a well-known 1.5 spacer. But double spacing seems to be standard in the law. Most judges double space their own documents. And certain style guides—such as the Chicago Manual of Style—say documents should be double-spaced. There are also practical considerations. You may prefer double-spacing, but opt for 1.5 spacing when you need more space. What line spacing do you use in court documents? Justice Scalia's opinion in Johnson v. United States is a significant opinion that received little coverage when it came out. In Johnson, the Supreme Court concluded that the Armed Career Criminal Act's residual clause was unconstitutionally vague. Johnson's ripples are reaching the circuit courts. Thanks to Johnson, the Eleventh Circuit changed long-standing precedent. Wayne Durham was found to be an Armed Career Criminal under ACCA, and he appealed his sentence. In his opening brief, he did not challenge the ACCA's constitutionality. (In 2013, the Eleventh Circuit, in a published opinion, found that ACCA's residual clause was not unconstitutionally vague.) Under Eleventh Circuit precedent, the failure to raise the issue barred Mr. Durham's attempts to raise it in supplemental briefing. This rule applied despite intervening Supreme Court law. Should this Court overturn its precedent barring an appellant from asserting an issue that was not raised in his opening brief where the issue is based on an intervening Supreme Court decision that changes the law? [W]here there is an intervening decision of the Supreme Court on an issue that overrules either a decision of that Court or a published decision of this Court that was on the books when the appellant's opening brief was filed, and that provides the appellant with a new claim or theory, the appellant will be allowed to raise that new claim or theory in a supplemental or substitute brief provided that he files a motion to do so in a timely fashion after (or, as in this case, before) the new decision is issued. Johnson is not affecting just the Eleventh Circuit. The Seventh Circuit recently held that Johnson applies retroactively: "Johnson announces a new substantive rule of constitutional law that the Supreme Court has categorically made retroactive to final convictions." Last Wednesday, prosecutors, public defenders, private lawyers, and law clerks packed into the media room of the U.S. Attorney’s Office to listen to District Judge Darrin Gayles, Magistrate Judge Patrick Hunt, and Bankruptcy Judge John Olson—gay men—talk about their experiences becoming and serving as federal judges. The panel discussion Road to the Bench, produced jointly by the U.S. Attorney’s Office and the Federal Public Defender’s Office, was, U.S. Attorney Wifredo Ferrer said in his opening remarks, “historic” (not, he said, to laughs, to show that the two offices could successfully work together). It was historic, he said, in light of this year’s legal and social progress. AUSA Karen Gilbert, who moderated, agreed, saying that she never thought she’d see in her lifetime three out federal judges discuss their experiences in a panel discussion. Each judge began by discussing his journey to the bench. For Judge Gayles, a former AUSA, the first time he could be Darrin Gayles “without reservation” was when Governor Bush appointed him to serve as a state-court judge. It was “liberating to a great extent,” he said. “I can be who I am and it will not hold me back professionally.” As a judge, he said he has “felt responsible” to be out and open, and to serve as an example. The discussion—which lasted over an hour—was informative, inspirational, and, at times, really funny (Judge Olson and Gilbert joked about the pressure to have “fabulous” chambers; Gilbert said that Ferrer, because he’s a great dancer, is sometimes mistaken as being gay). But the judges recalled a difficult not-to-distant past, and said that many challenges lie ahead. Judge Hunt recalled when he was an AFPD having to explain to judges the difference between HIV and AIDS, and how that affected when defendants must be sentenced. It is “absolutely frightening” what is happening in other parts of the world, Judge Olson said, where being gay is “a dangerous thing.” Suicide is a serious problem among young gay people, he continued, and it may be worse for transgender youth. “We as a society have to do more to help,” he said. Special thanks to AUSA Robert Watson for suggesting that the Blog cover this fantastic event. "Keep calm and support LGBT"
I don't always agree with Justice Scalia's dissent, but, usually, I find them entertaining. In a recent Washington Post op-ed, however, former Justice O'Connor clerk David Kravitz takes me to task. Mr. Kravitz believes that Justice Scalia's dissents lately ignore compelling arguments and rely, instead, on insults. In honor of the amicable dissent, I've listed four of my favorite dissents. None are antagonistic, but all make great, compelling arguments. 1. Justice Holmes, Lochner v. New York: Short but effective. In one sentence, Justice Holmes makes his point and guts the majority opinion: "The liberty of the citizen to do as he likes so long as he does not interfere with the liberty of others to do the same, which has been a shibboleth for some well-known writers, is interfered with by school laws, by the Post Office, by every state or municipal institution which takes his money for purposes thought desirable, whether he likes it or not." 2. Justice Kagan, Arizona Free Enterprise Club's Freedom Club Pac v. Bennett: Justice Kagan's introduction is concise and persuasive in ways most legal writing is not. It turns an amorphous constitutional issue into a concrete example. 3. Justice Jackson, Korematsu v. United States: In plain English and with plain logic, Justice Jackson explains why Korematsu's encampment was unconstitutional and dangerous. 4. Justice Harlan, Roth v. United States: Technically concurring in part and dissenting in part, Justice Harlan persuasively explains why the federal government should not have unbounded discretion to outlaw obscenity. And he simply yet powerfully explains why free speech is not a popularity contest: "Many juries might find that Joyce's 'Ulysses' or Bocaccio's 'Decameron' was obscene, and yet the conviction of a defendant for selling either book would raise, for me, the gravest constitutional problems, for no such verdict could convince me, without more, that these books are 'utterly without redeeming social importance.'" So, what other dissents should go on this list? Today, the Eleventh Circuit handed down a major victory to David Markus's client Dr. Vanja Abreu. In a lengthy opinion, the court reversed Dr. Abreu's conviction on a conspiracy charge, holding that the district court erred in denying her motion for judgment of acquittal. Congrats, David. Update -- David tells me his wife and law partner, Mona, did the briefs. Congrats, Mona.